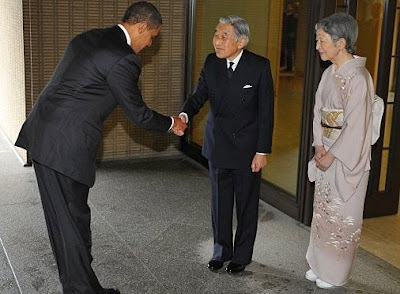 Home » barack obama , george w. bush , hypocrisy , japan , politics » "...Only to God and woman." "...Only to God and woman." Bush's supporters at the time claimed that Bush was just "following protocol", exactly as Obama's defenders are doing now. Me? I can't see a difference between what either of these two Presidents have done. And regardless of who's doing it, it sickens me to no end. If either Bush or Obama had acted like this as private citizens, that would have been their right. But Bush and now Obama, as elected head of state of the United States of America, each ceremoniously capitulated their nation to a foreign sovereign power. This ain't about our home-grown assumption that the United States is "the greatest" country on Earth and everything with our understanding that in the roll call of nations ours is equal - no more and no less - to any other. That's not a small matter, folks. And I can't see how it can be defended. A little over a hundred and fifty years ago in 1859, John E. Ward arrived in China. Ward, a proud native of Georgia and former mayor of Savannah, had been dispatched by President James Buchanan to begin trade relations with China in accordance with the Treaty of Tientsin. But before such could happen Ward would have to come to Peking: a place that no American had been allowed to enter. Ward was allowed to proceed but on every step of the journey he asserted his native land as equal to China and not as a vassal state, as the Russians and the British and everyone else had done according to "diplomacy". The final act of "insolence" on the part of this American "barbarian" was his refusal to kow-tow: a low bow before the Emperor. John E. Ward refused to bow. The representatives of the Emperor told Ward that he must bow not only for purposes of diplomacy but out of respect for the land's religion. The reason Ward gave the Chinese: "I kneel only to God and woman." True to his word, Ward did not bow to the Emperor of China. He never got the audience with the Emperor that he had been sent to have, but Ward wasn't fazed. He still delivered his letter about the treaty (to a minor official) and returned to America, his pride upheld... and China beginning to respect "the Country of the Flowery Flag". You can read more about John E. Ward at AmericanHeritage.com. Y'know, I can't even begin to imagine either Bush or Obama getting up the nerve to think of something as brazenly principled as "I kneel only to God and woman." In the chronicle of American statesmanship, John E. Ward is certainly the greater man than our two or three or four most recent Presidents of the United States. And if we had men (and women) of Ward's caliber and character, this nation would no doubt have more respect and standing among the countries of the world today. If a foreign dignitary came here and refused to shake hands with the president, everyone would be outraged (except for some neo-cons who would actually be pleased). Same deal here ... for both presidents. Your world view is very small. "If a foreign dignitary came here and refused to shake hands with the president, everyone would be outraged..."
Wouldn't bother me in the least. And since when is a handshake equivalent to a bow of traditional submission? Is it me, or does that photo look like it's been photoshopped? Looks like the heads have been forced together. Any video available? However, even if it is, it still doesn't change the truth of the blog article. My guess is that between our current and former winning presidents, our next president or two will go the opposite direction with the whole "showing reverence" thang. Not a fan of Obama or anything, but I think he's just respecting Japanese culture. It means "I respect you". I was actually talking to my dad about this earlier and the only thing he was wondering was whether or not the Emperor bowed as well. Overall, this is only a controversy because people will criticize the President over anything. I mean, they criticized him for the way he ordered his burger.